As I walked in the woods today, with a premature autumn note in the air, my thoughts turned to Thoreau. “The price of anything is the amount of life you exchange for it.” Moments at peace in clean air, ripening leaves, and crispening air are priceless. And I’ve found that in terms of wine, its price does not need to equal the quintessential arm and a leg pay-to-play fee. Enter: The Riesling. 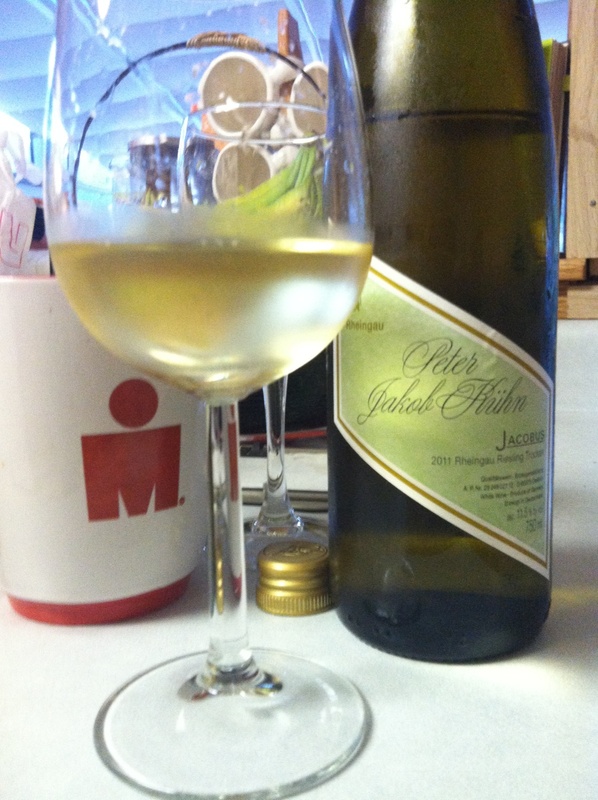 The Wine: Peter Jakob Bruhn’s “Jacobus”‘s 2011 Rheingau Riesling Troken is a single vineyard Riesling and it is amazing. I mentioned I went for the first walk of a burgeoning autumn in Minnesota, and it’s taste is that like a color wheel of fall leaves swept over a golden, green field on the edge of a darkening woods. On the nose, there is a bit of yeasty brioche, as if a distant cousin of Champagne. On the palette, there are notes of green and golden apple, with a faint bit of pear and hints of passion fruit. The acid is high, and it is a crisp, bone dry wine with a medium-long finish and no lingering tartness. It is complex like the light entering an evening in the autumn woods. If you are a fan of reds when the temps start to drop, you might have another wine to add to the line-up. This wine pairs nicely with some Italian antipasti and high-acid foods–it will go well with fish or even a day in front of a football game. At 11.5% in alcohol, it ranks a little higher than other Rieslings, but you can drink this entire bottle AND still make the workout in the morning. Just be prepared to look at a white wine, and a Riesling, in a new way. Again, in Thoreau’s words, “It’s not what you look at that matters, it’s what you see.” You will see a quality wine in a quality Riesling.